New London is a city that is best described as being diverse. It offers its residents access to varied housing opportunities, public parks, restaurants, and a trendy art and music scene. New London, CT also provides excellent business opportunities and is home to large commercial businesses and successful small businesses alike! The pest professionals here at Big Blue Bug Solutions have the tools and experience needed to protect both home and business owners living in New London from pest like ants, spiders, roaches, flies, mosquitoes, ticks, earwigs, stinging insects, and more! Our pest control programs are designed to eliminate pest problems in a safe and effective manner from any size New London home or business. Coverage against most common pests. Three preventative maintenance visits per year. Return visits at no charge to you if pests come back between visits. Our Blue Glove Service - all of our technicians wear blue glove and blue booties when inside of your home. Along with our general residential pest control services (Home Owner’s Policy), at Big Blue Bug Solutions we offer the following residential pest control services to help eliminate and control specific pests in and around your New London home. Big Blue Bug Solutions has been protecting New England businesses from damages due to pests like insects, rodents, and wildlife for the last 80 years. Our professionals are committed to ensuring that your facility becomes and stays pest free through our Monthly Maintenance Program. Our Monthly Maintenance Program includes once a month visits made to your commercial facility by our highly trained and dedicated professionals. Our professionals provide monitoring services for pest activity, along with preventative treatment services; and if possible, any pest problems that are uncovered during a visit will be taken care of immediately. We understand how important quick response is to protecting your facility from damage caused by pests and to protect your business’s reputation within the community. In addition to our monthly maintenance program, we can provide these following services and more to help keep your New London business free of pests! Eastern equine encephalitis, West Nile virus, and Lyme disease are all serious diseases that can be spread by ticks and mosquitoes found living in New England. Mosquitoes and ticks are both parasitic pests that unless action is taken, you will come into contact with frequently in your own back yard. The best way to eliminate dangerous disease spreading mosquitoes and ticks from your New London property is to partner with the experts here at Big Blue Bug Solutions. A thorough inspection of your property to identify any breeding and hiding sites. It is also important to note that at Big Blue Bug Solutions we can provide New London residents with a one-time mosquito service in order to help reduce numbers for a large outdoor event or gathering. One time or all season long, let our experts give you and your family relief from invasive mosquitoes and ticks! 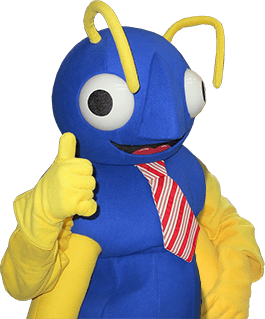 At Big Blue Bug Solutions we are not only famous for mascot Nibbles, but for our exceptional, effective, and environmentally responsible pest control services! With the help of Nibbles we are happy to say that for more than 80 years we have been protecting New England homes and businesses from the pests that invade, introduce diseases, damage property, and cause stress. We are committed to helping keep our customers healthy and safe, and New London homes and businesses protected from pests. At Big Blue Bug Solutions we maintain a simple promise - that your New London, CT property’s pest problem (s) will be eliminated. Every single bug will be gone once our services are completed! Contact us today to get started protecting your New England property from insects, rodents, and wildlife with the help of the experts found at Big Blue Bug Solutions!